Give this standout 1st place medal to your number one achievers. As one of the more versatile awards offered, you can present this to academic competition winners, athletic event winners, or even one of your mates who just needs a little encouragement. Comes with your choice of ribbon colour. 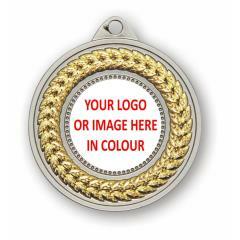 Your text is laser engraved onto a Gold plate then attached to the rear of the medal.